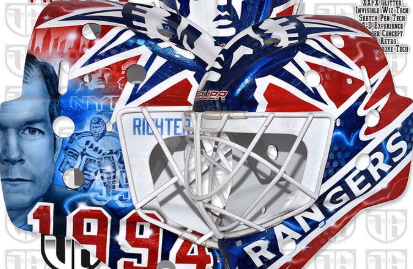 Henrik Lundqvist will wear a custom Mike Richter mask on Friday. Henrik Lundqvist is paying tribute to former Rangers great Mike Richter in the best way possible. The Rangers and the MSG Network are honoring the team’s 25th anniversary of the 1994 Stanley Cup-winning team on Friday. Lundqvist, who’s tied with Richter for the longest tenured goalie in franchise history with 14 seasons in the Big Apple, shared his custom mask honoring the all-time great U.S. goalie. Created by the custom mask designer DaveArt, Lunqvist’s mask features a ton of references to Richter’s time in New York. The helmet has the same statue of liberty design and Rangers text from Richter’s playing days. Added alongside the classic mask homage, is Richter’s face, a small rendering of him between the pipes and the date 1994 written in big red letters. The 1994 Rangers were one of the best team’s in the history of the Original Six squad. The team starred Richter in net, captain Mark Messier and a plethora of very good players, including wingers Adam Graves and Steve Larmer, along with defenseman Sergei Zubov and Brian Leetch. New York managed to beat Pavel Bure and the Vancouver Canucks in seven games for their first Stanley Cup in more than 50 years. The mask is awesome. It’s great to see Lundqvist honor Richter in such a classy way.